CCleaner has been a widely used disk cleanup program to help tidy up your computer and free up disk space. At one time it was a go-to application for many to clean things up quickly and efficiently, recommended by many. Sadly, their programs quality went downhill substantially over the years. Bug reports would often go ignored for months at a time. I can recall using it in the tech shop where I worked. Even then, it caused problems on a few machines we worked on. Those were mainly due to the registry cleaner. It should be common knowledge by now that registry cleaners do nothing to improve performance. Now, CCleaner is known to break Cortana, indexing, caused Blue Screens with the November Update, vital Windows components, issues with Steam's VAC, and the list goes on and on. Many of these are simple to find just by doing a search for what CCleaner breaks. This once great program for quickly cleaning a computer has since become more of both a problem and a security risk than what it's really worth. The time where CCleaner was a quality program is no more. Just a few years ago I discussed changing over to BleachBit. In this discussion I covered several areas of concern, though a major one was how CCleaner adds a CCleanerSkipUAC task into your Task Scheduler Library. The problem with this is that they are bypassing a security check because CCleaner needs permission to access your hard drive and registry as well. So, why add in this CCleanerSkipUAC task? That's where many problems begin is because CCleaner is setting cleaning options and more to be enabled for things that should never be touched. 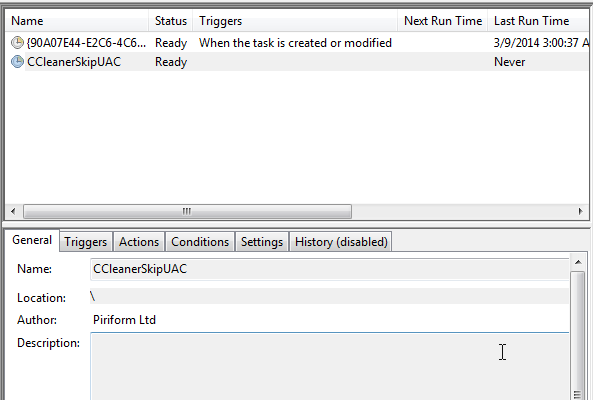 There is an option in CCleaner that was added back in May 2012 to skip the UAC check, but the major problem here is that it too is enabled by default. Users should opt-in to this, not have to opt-out. Many users have no idea this option even exists! You can even see for yourself the task that is added without a user's knowledge in our screenshot below. A thread on reddit discussing the Windows 10 Anniversary Update covers numerous user questions and concerns. In this thread they explicitly say to avoid using CCleaner and to instead use the built-in Windows Disk Cleanup tool. The built in Windows Disk Cleanup tool is far safer and still removes temp files. Why is CCleaner not recommended anymore? I thought registry cleaners were a part of essential maintenance? Registry cleaners have been non- essential since Windows Vista, as Windows is now capable of maintaining its registry and require programs to better clean up. CCleaner, for whatever reason, likes to “clean” (i.e. delete) Windows components, which can lead to lots of issues, such as broken search indexing, broken Windows update and other major problems. A good proportion of frequent issues on /r/windows10 relates to CCleaner usage. A trip to the developer, Piriform’s forums may give you some indication into the issues it can cause. For clearing up disc space, it is instead recommended to use Microsoft’s own built in clean up utility. To access, press start, type ‘disc clean up’ (without quotations) and open the utility. From here you can delete temp files, cache files, upgrade logs and previous updates without fear of damaging your install. Many threads can be found on reddit discussing why people should avoid CCleaner entirely. It seems over the years the number of problems this program causes have grown and have not been properly addressed by the developers. Due to the high number of issues CCleaner has been found to cause, Lunarsoft will no longer be recommending CCleaner as a recommended or useful program. Stay safe, uninstall CCleaner and let the Windows Disk Cleanup tool do it's job. It works just fine and won't put you at a high risk of causing problems on your Windows install. I want to break Cortana - how do I get it to do that? I've just turned mine off since I first installed Windows 10. Apparently the Anniversary Update broke it anyways. Start > type Cortana > click the Gear > Turn off - that's how it was done before. There's also this from HowToGeek.